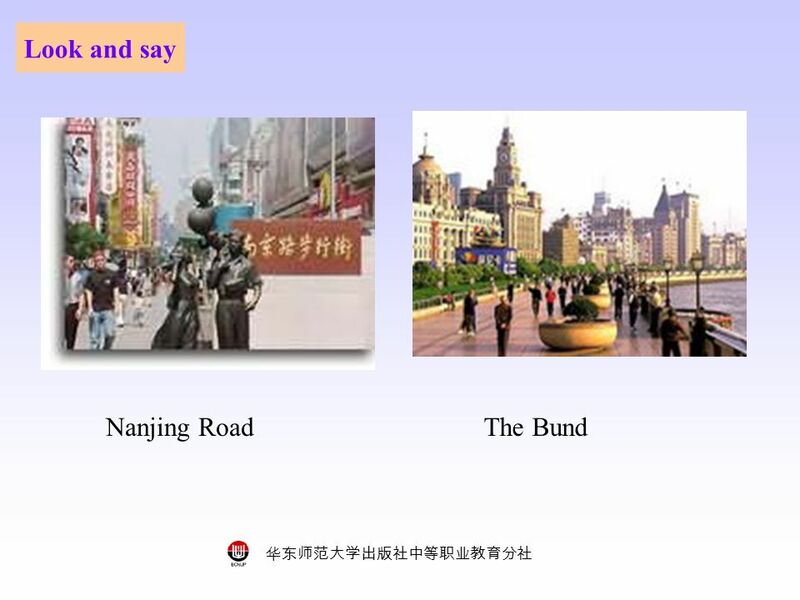 华东师范大学出版社中等职业教育分社 Lesson 13 A City Tour. 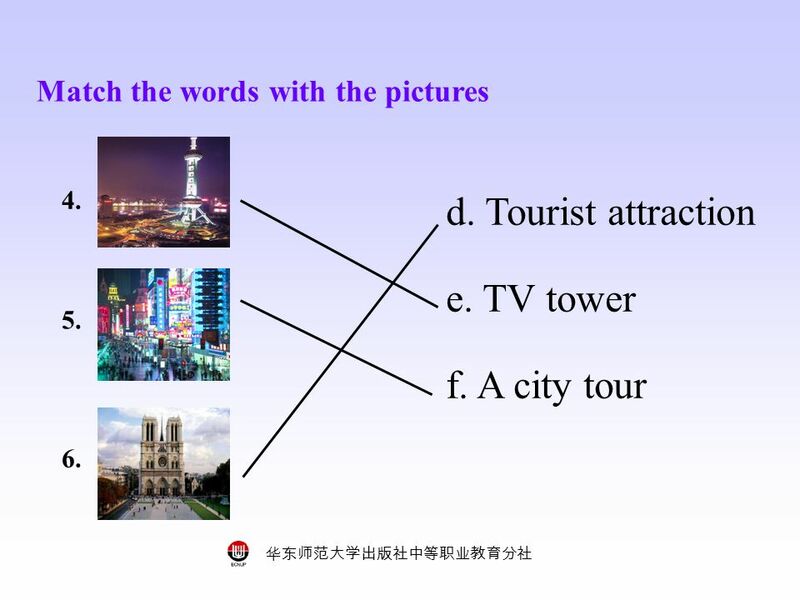 华东师范大学出版社中等职业教育分社 Task 1 Match the words with the pictures a.coach b.maglev c.admission ticket 1. 3. 2. Step. 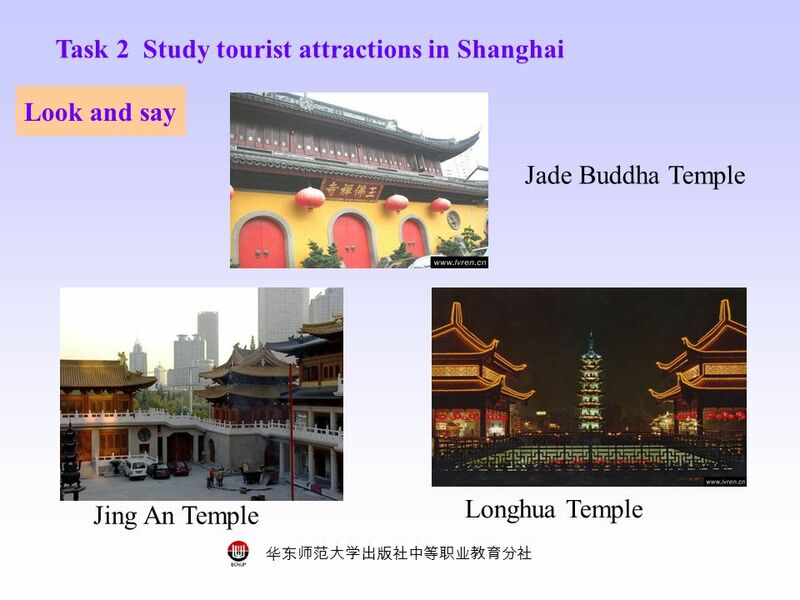 12 华东师范大学出版社中等职业教育分社 Step 2 Tour Service Task: Study the conversation and find the sentences for 1)Asking about booking information --- Shanghai City Tour Office. May I help you? 2) Introducing a sightseeing route --- The Gold Line Tour takes you to five attractions in the city, and one tourist attraction in the suburbs. 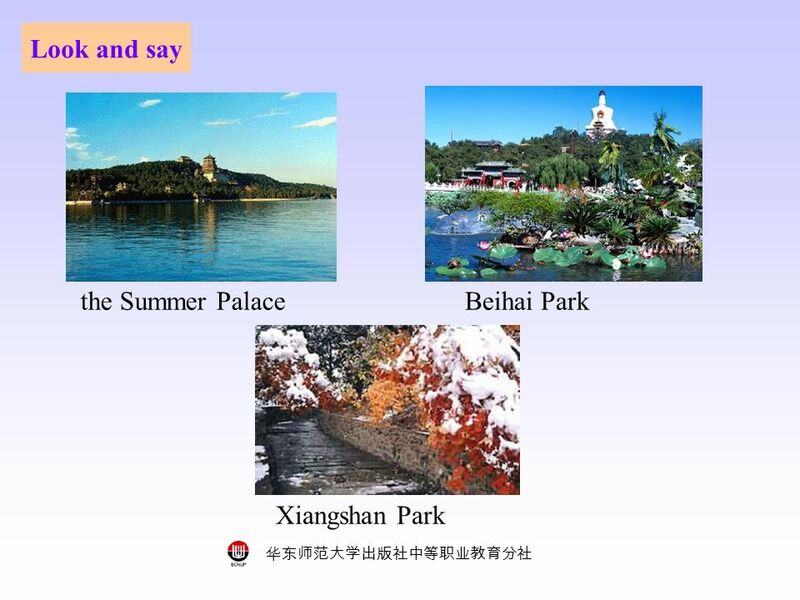 --- The Silver Line Tour takes you to five tourist attractions in the city. 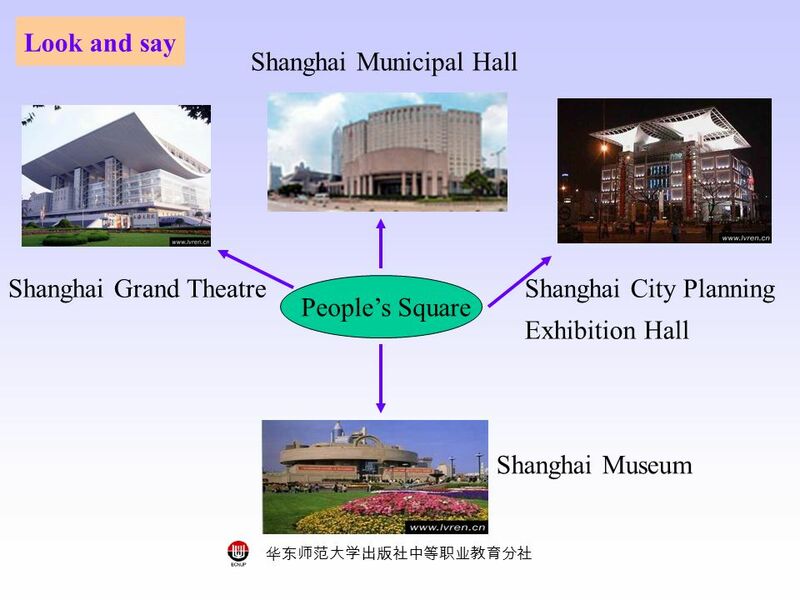 3) Asking about the length of the tour --- How long does this plan take? 4) Asking for additional information --- Can you tell us more details about the service? 5) Asking about the details of the price --- What is the price? 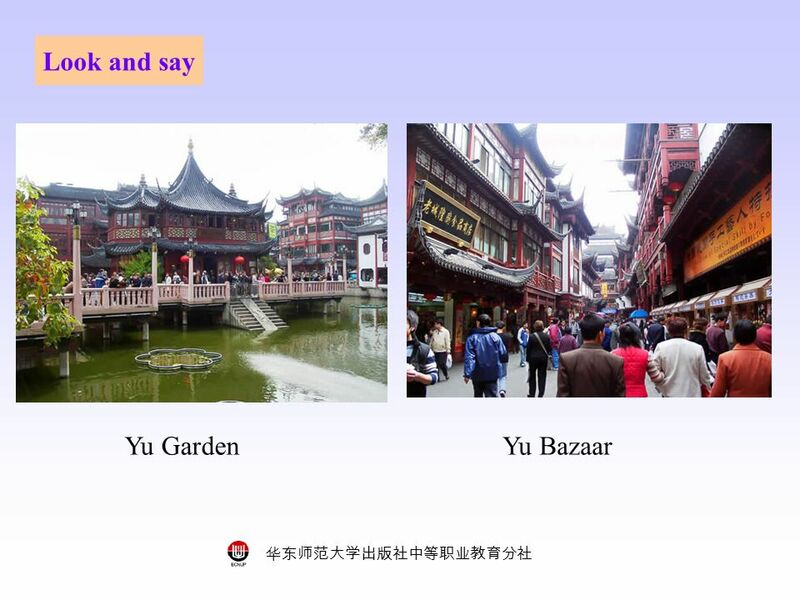 --- Does the price include tips to the tour guide and admission tickets? 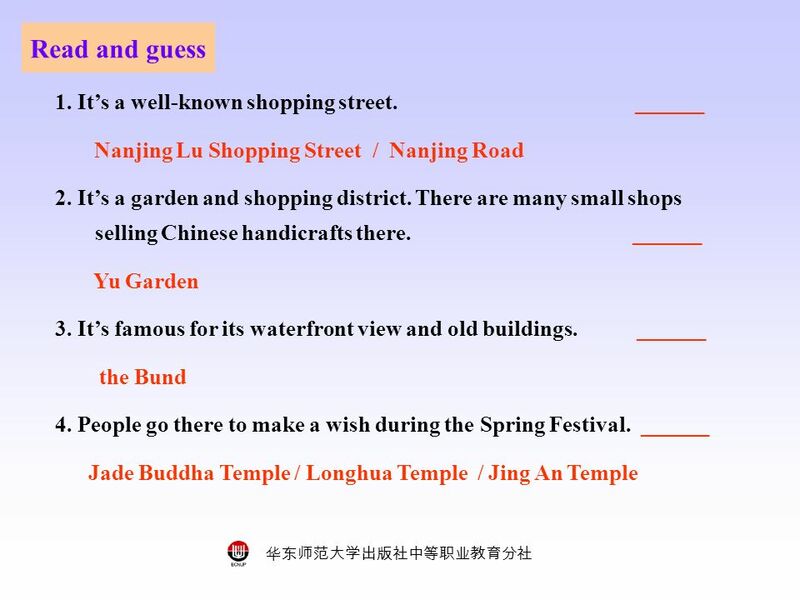 13 华东师范大学出版社中等职业教育分社 Step 3 A promise to keep Task 1: Group work activity If you had a chance to visit Beijing, where would you go first? 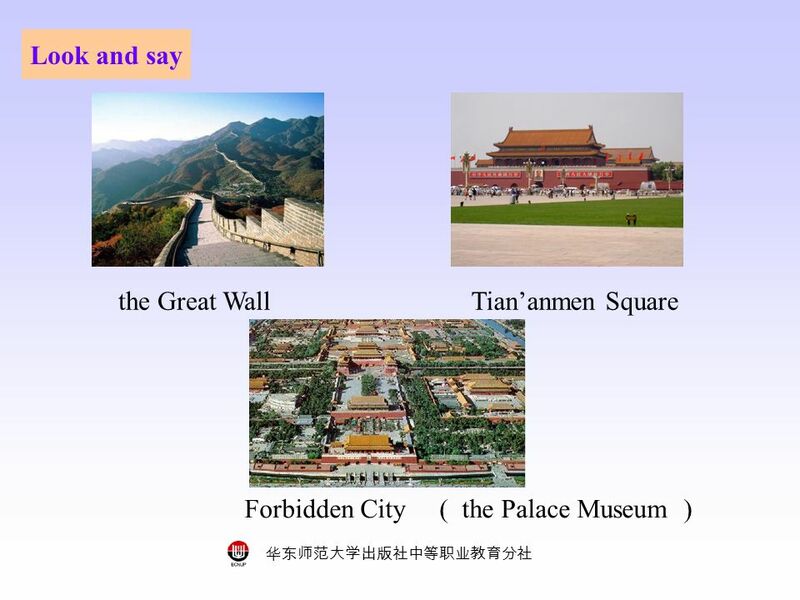 List three places that you want to see and explain why to your classmates. 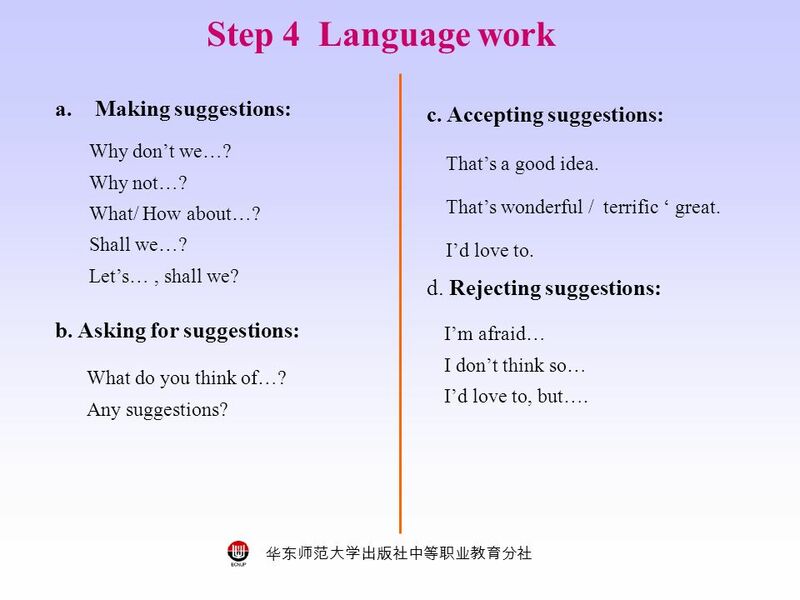 18 华东师范大学出版社中等职业教育分社 Step 4 Language work a.Making suggestions: b. Asking for suggestions: c. Accepting suggestions: d. Rejecting suggestions: Why don’t we…? Why not…? 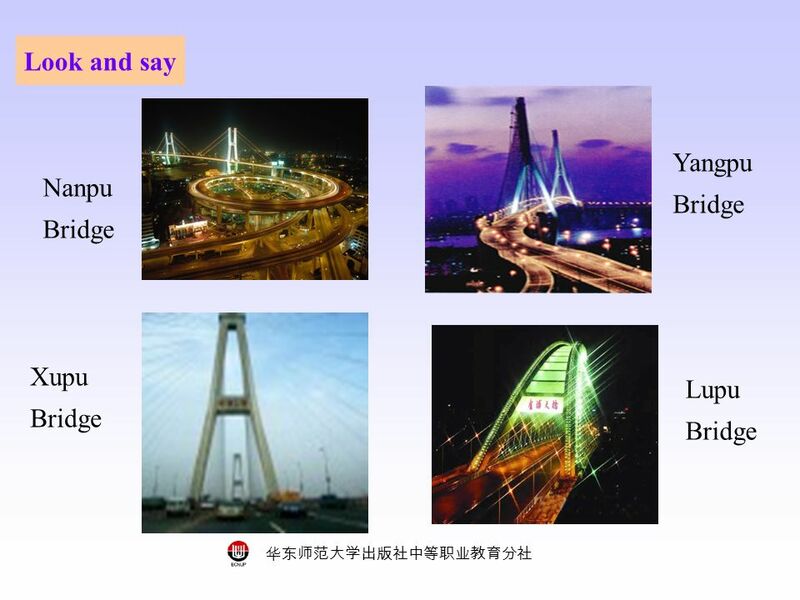 What/ How about…? Shall we…? Let’s…, shall we? What do you think of…? Any suggestions? That’s a good idea. That’s wonderful / terrific ‘ great. I’d love to. I’m afraid… I don’t think so… I’d love to, but…. 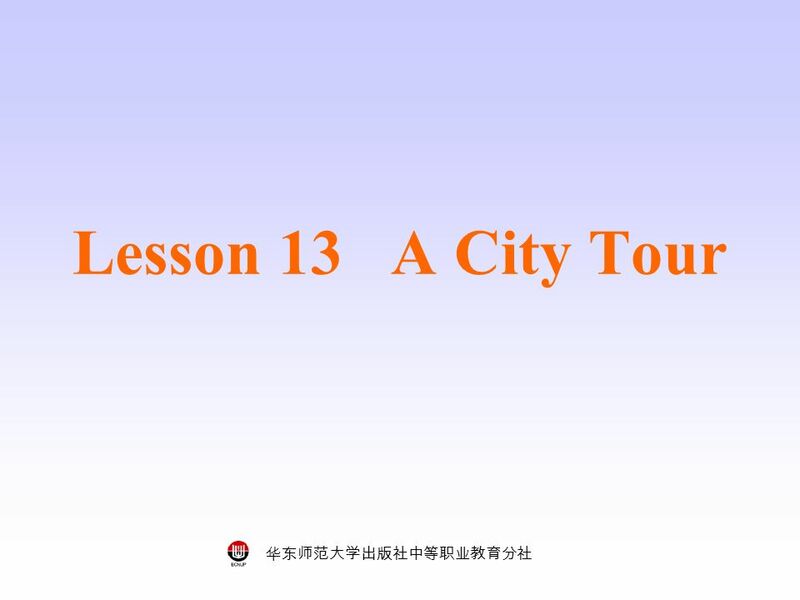 Download ppt "华东师范大学出版社中等职业教育分社 Lesson 13 A City Tour. 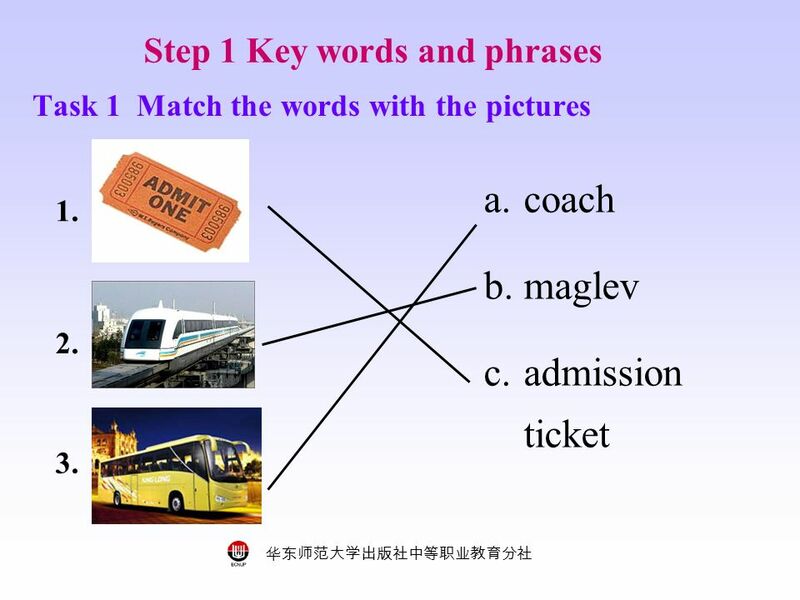 华东师范大学出版社中等职业教育分社 Task 1 Match the words with the pictures a.coach b.maglev c.admission ticket 1. 3. 2. Step." 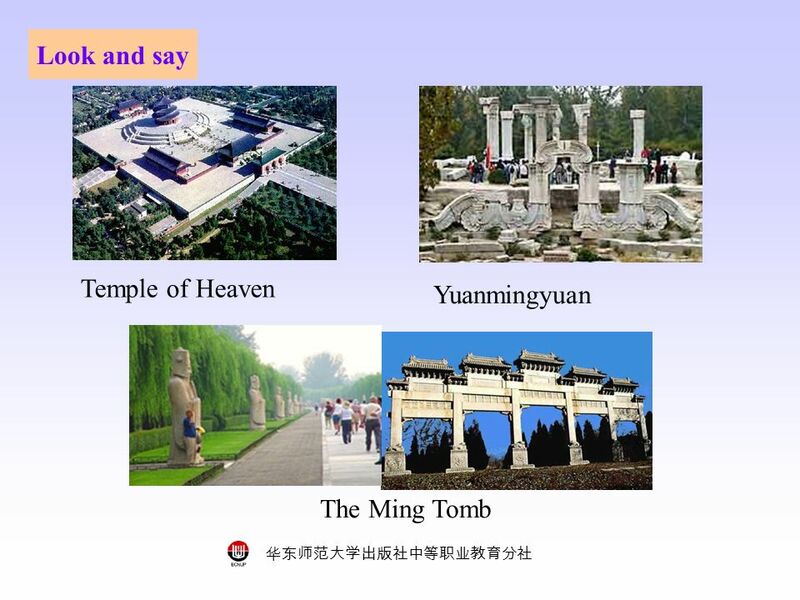 闸口中学 廖丽丽. bike train train bus subway car plane. 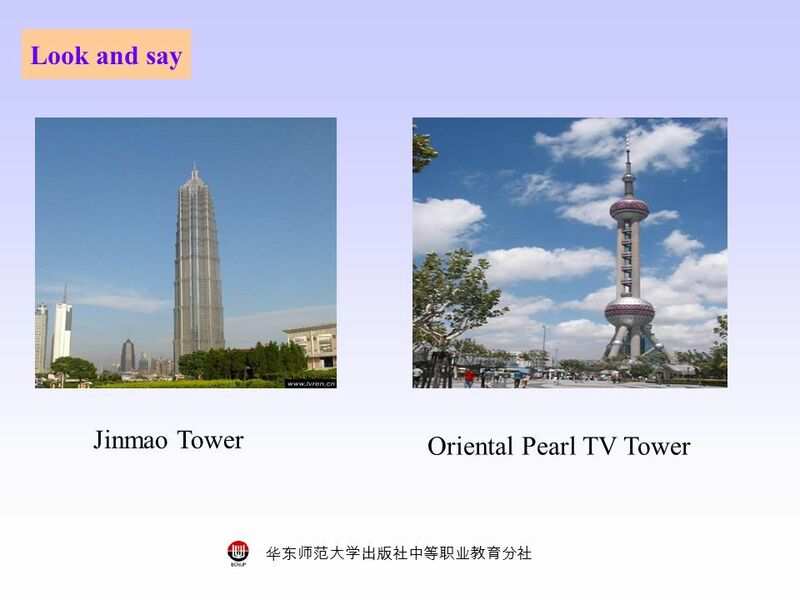 新目标 Go For It 九年级 Unit3 情景交际用语之问路与指路 广东省东莞市石碣袁崇焕中学 彭丽霞. Welcome to our class! 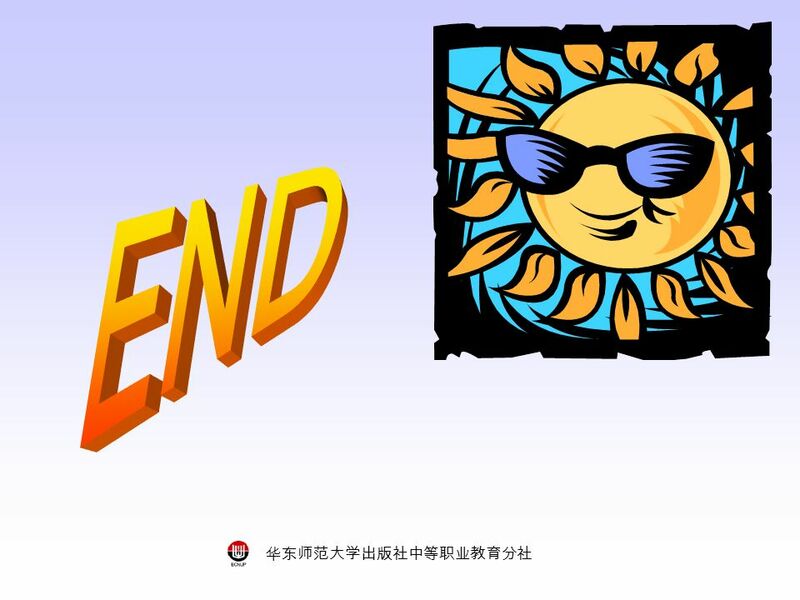 Section A 1a-2c Made by Fenghua Song Danan Middle School Gangkou, Zhongshan. What do you think of _______? I like it. I don’t mind it. I don’t like it. I can’t stand it. I like it very much. I love it. It’s delicious. They are.